Welcome to La Gomera, the island that time forgot. 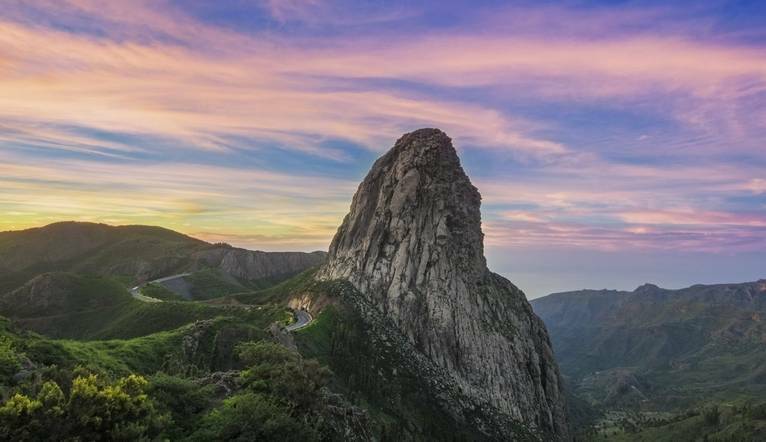 Thanks to its size and steep landscape, La Gomera is one of the most untouched Canary Islands and a true paradise for hikers. Join us on this medium-graded walking holiday, as we marvel at steep cliffs, laurel rainforests, canyons, black sand beaches and endless views. Without a doubt, this will be a walking holiday to remember! After landing in Tenerife, we will transfer to Los Cristianos before transferring by ferry to San Sebastián de la Gomera. We will be directly transferred to the quiet village of Chipude, where we stay for the first 3 nights. 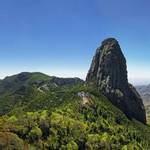 Our first hike offers you great panoramic views of the northwest of La Gomera. Starting in the nice village of Vallehermoso, we will follow a gentle path on the ridge of the massif of Teselinde, and a great downhill offering great views on the coastal cliffs. Today will be spent discovering the magnificent canyons of the west part of the island. 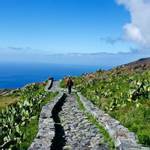 This spectacular hike will help us understand the whistling language of La Gomera. Starting from the hotel, we will walk all the way down to the beach. Today we can enjoy a well-earned day off! We transfer to San Sebastian, our base for the last four nights. Depending on the weather conditions, you could enjoy an optional half-day excursion to see “Los Órganos”, a spectacular volcanic cliff only reachable by boat. Today we enjoy a magnificent downhill walk through the Laurisilva forest. This hike showcases almost everything the island has to offer: the silent and lush forest, the running water, great views towards Teide on neighbouring Tenerife and Hermigua, and views over wonderful agriculture areas. Today is at leisure - why not discover another part of this fascinating island? Today we can enjoy one of the most spectacular hikes of La Gomera. Going down the incredible canyon of Guarimiar and finishing in the hamlet of Targa, this path may remind you of the Dolomites! We say goodbye to La Gomera and take the ferry back to Tenerife for our return flight back to the UK. The transfer time from Tenerife South Airport to Chipude, La Gomera is approximately 4 hours, depending on weather and traffic and includes a ferry crossing. Four guided walks are included in the programme. Your walking guide will advise you in resort of the daily programme. The walking programme is graded as Medium and you can expect to walk 8 to 12km per day, with ascents/descents (some of which are steep), rough underfoot terrain and high altitudes involved. This is not suitable for those who are nervous of heights or suffer from vertigo. 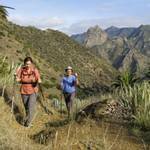 Our first hike offers you great panoramic views and discovery of the northwest of La Gomera. Starting in the nice village of Vallehermoso we follow a gentle path on the ridge of the massif of Teselinde, and a great downhill offering great views on the coastal cliffs. 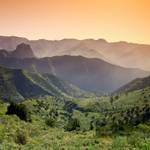 Discovering the magnificent canyons of the west part of the island. 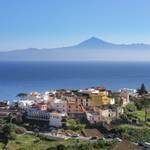 This spectacular hike will make us understand the whistling language of La Gomera. Starting from the hotel we walk all the way down to the beach. Today we enjoy a magnificent downhill walk through the laurisilva forest. This hike offers us almost everything the island has: the silent and lush forest, the running water, great views towards Teide on neighbouring Tenerife and Hermigua, and views over wonderful agriculture areas. Without doubt today we can enjoy one of the most spectacular hikes of La Gomera. Going down the incredible canyon of Guarimiar and finishing in the hamlet of Targa, this path may remind you of the Dolomites! We suggest a Group Collection to cover transfer drivers, and hotel staff of €20 per person. Your Tour Leader will collect this on your behalf and distribute it accordingly, thus relieving you of the burden of who, when and how much to tip. The tipping of housekeeping will be left to your individual discretion (a small amount left in your room on departure should cover this and would be much appreciated). As is customary, ‘the hat’ will be passed around for the driver and guide on all optional excursions. For any meals that are not included in your itinerary, or taxi fares, your Tour Leader can advise of an appropriate Ϻdd on.